I have always been a person who really cared about oral healthcare. I go to the dentist every six months, floss and brush twice a day and use mouthwash countless times a day. 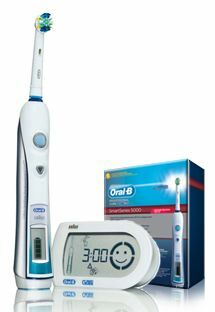 I have always used a regular manual toothbrush never having really thought about switching to an electric toothbrush. Both of my son's use an electric toothbrush so I am not really sure why I haven't switched. The time has officially come however, I have switched to an electric toothbrush. I was given the opportunity to test the Oral-B Professional Precision 5000 electric toothbrush and I am hooked. I have been using it for three weeks now and will not be going back to my old toothbrush. I mentioned above that I am pretty good with oral healthcare but I can't say I do everything right. One thing my dentist is always scolding me for is brushing my teeth too hard. I always felt like the harder I brushed the cleaner my teeth were getting. This turned out to not be true. This is one reason I love this new electriv toothbrush from Oral-B. There is actually an icon that pops up if you are brushing too hard. I also love the ico that shows you what area of your mouth to brush. It is called the quadrant circle and flashes to show you where you should be brushing. As you brush each of your mouth's quadrants you get a star, ending with four stars. This feature was very fun for me. It almost felt like I was playing a game. This Oral-B toothbursh provides a better clean with up to 40,000 pulsations 8,800 oscilliations per minute, which is up to 50% more brush movements vs, the other leading electric toothbrushes. I really love this toothbrush. I just can not believe that a toothbrush can be as smart as this one. I always thought I had a great brushing routine but after using this toothbrush for three weeks I have seen an improvement in my brushing routine as well as in the look and cleanliness of my teeth. I really like the manual Oral B toothbrushes because of their shape and the bristles. I must check this Precision 5000 out, it sounds like the best.